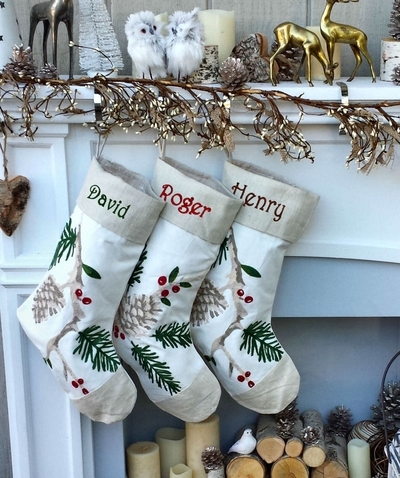 White Linen and Canvas Christmas Stocking with Rice Stitch embroidered Pine Cone and Branch theme to set off a Nostalgic White Christmas Woodland Look. The stocking measures 20" diagonally from the stocking loop hanger to the toe. The cuff where we personalize the stocking is 7" wide. Materials: Linen and Canvas , Carefully lined inside for that perfect hairloom look. Lining: The stocking is lined inside with white matching material. You can make a set : there are two designs, looking similar but different for that consistent but "in a set look". In our picture, DAVID and HENRY are on the Branch Down design and ROGER is on the Branch Up Design.